Note: The images all have notations if you scroll through. 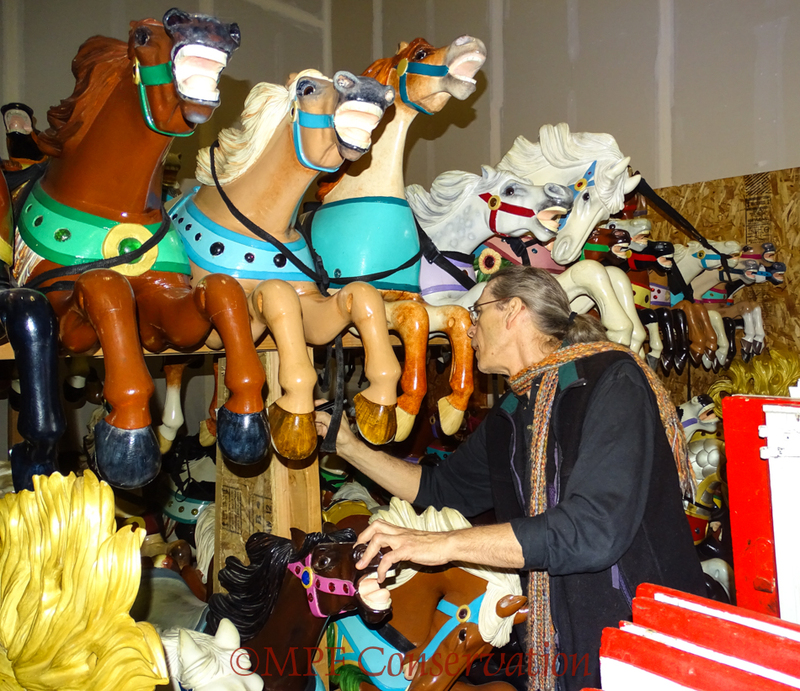 simple assessment of the Jantzen Beach Carousel Horses toward proper restoration. an itty bitty walkway (cover your pants in grease as you went) where we had to duck and bob and look around shields and beams and poles underfoot, to see the horses tucked way back into the left corner. Mitchell is standing on an 18×30-inch cleared stand-able space, above. I am immediately charmed by the horses lined up, so touchable! and the 9-foot Cresting Boards, right. Here the first horse, a lovely Peekaboo, is carried off by Joe and Sean. The four moving men were divided into two groups. to re-stack the shields out of the paths. and could actually walk around without tripping. NOTE: Specs of white floating in the images are dust in the storage facility. We also found the smaller bench, the Lion Chariot! They carry the heavy double bench a few feet, being careful where they put their feet. I am holding my breath. Again, Mitchell and I worked left side / right side. On the right side they finally were able to move the huge stack of 8×8 beams temporarily. and carried it where it would be loaded into the moving truck. We needed to share this space with the operational assessment crew. 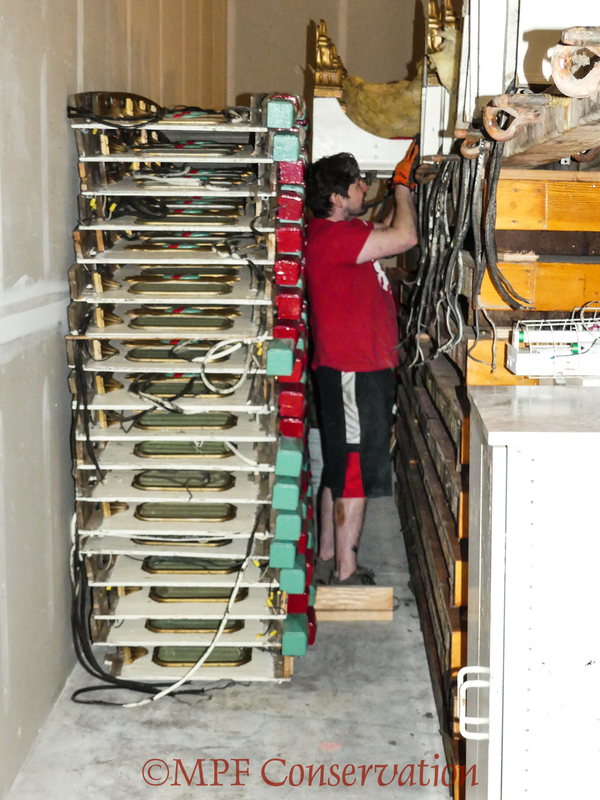 Right side, the rounding boards were moved and assessed, then restacked. We decided the cresting boards should be stacked in front of them. and also to allow us to move the cresting boards out for repositioning. while Joe lifts and steadies the beams in the back. Several decorative beams were moved out for inspection and assessment. last image; two came back to the studio. Day two, I assessed several items that will not come back with us to the studio, as they are either too long or too heavy: Beams, mirrored shields, painted shields. Cherub shields, decorative mirrored shields, cresting boards. A couple of Parker Ponies ride in my back seat! a few objects must go back into the storage so it can be locked up. End of second day, heavenly order! but also wanted a sampling of the types of damages on all the horses. By day three we had our options, and final choices were made. and the HUGE chariots and other parts into the truck! Fifteen (mostly) badly damaged horses came back with us. with a promise to be back SOON. Marie Kondo has nothing on us! Some of the horses that were chosen, above. Sean Morgan, Vitaliy Kolyvanov, and of course, Mitchell Powell and I! 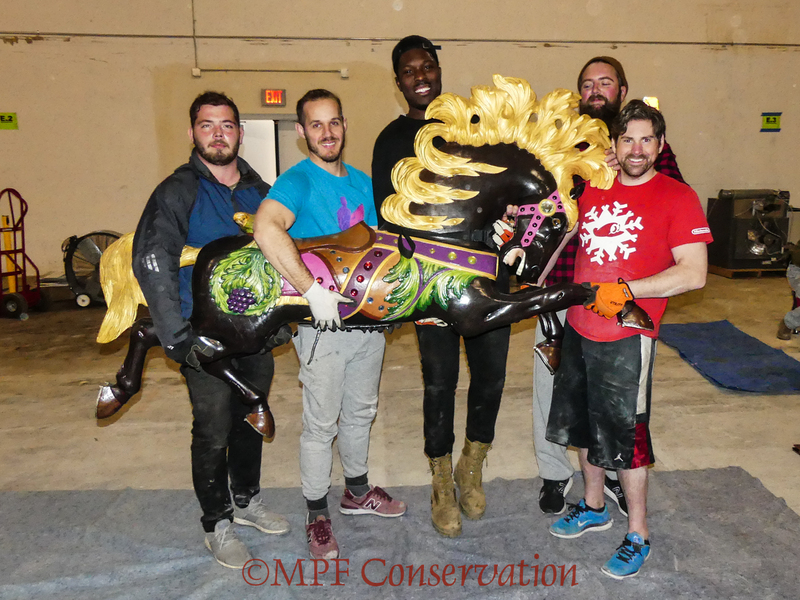 This entry was posted in antiques, conservation techniques, decorative motifs, Interim Report, painted objects, preservation, process, wooden objects and tagged #carouselhorses, #jantzenbeachcarousel, #mpfconservation, #nwportland, #objectconservation, #parkercarousel, #polychromeobjects, #portlandoregon, #restoreoregon, #stargazer, #woodenobjectconservation, carousel, horses, Jantzen Beach Carousel, object conservation, painted objects, polychrome, Restore Oregon, wooden object conservation. Bookmark the permalink. 26 Responses to Jantzen Beach Carousel Moving Day! This leg of the project is funded by a cultural heritage grant! I have some history with Jantzen Beach Park. My dad (Don Meredith) was Superintendent of Park Maintenance for a few years. One of my uncles (Willard Meredith) ran the roller coaster, his wife (Helen Meredith) worked the Mirror Maze and another one of my uncles (Gerry Mackey) owned the games on the midway. I worked on the midway (first as balloon boy, then as barker for SkeeBall) in 1970, the last year the park was open. I was 14 at the time. 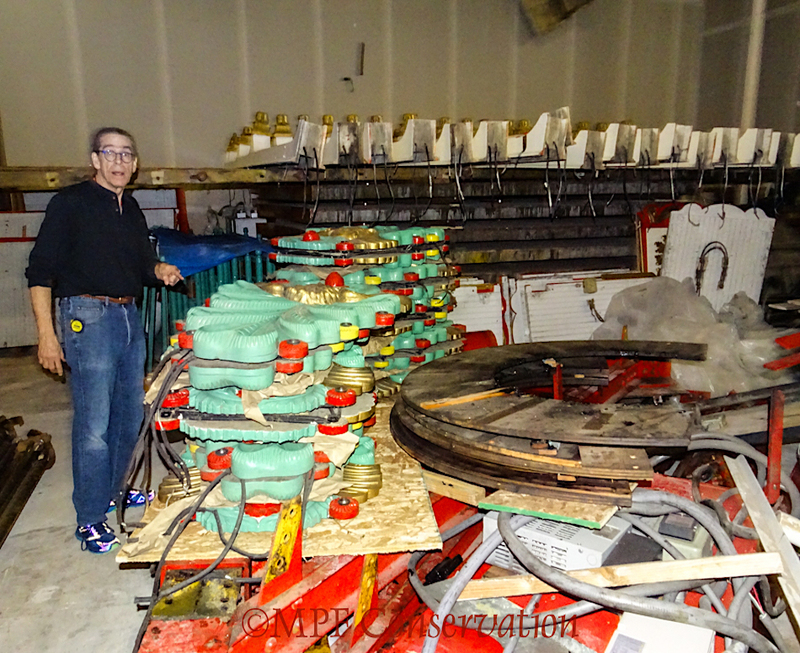 My dad shared a few memories of the carousel’s brake system he installed way back when. His system was replaced when the carousel was moved in the mall. So nice to see this great machine again! Keep us updated. Thank you! Thanks Mark for that bit of history! Are any of them still living? If they have memories of the carousel that would be wonderful — you too! We have lived on Hayden Island for 26 yrs now….kids are 19 and 15 and rode that many times. Would love to see it back at Jantzen Beach. I wish I could tell you where it is going but that is not known yet. Follow us or Restore Oregon and when it is announced, you will know! Also, pics and memories are very nice to have!